Chinese shipbuilders have completed three advanced nuclear-propelled submarines that can fire the latest vertically launched anti-ship missiles, local media reported. Satellite pictures broadcast last week by China Central Television showed three submarines anchored at an unidentified port, China Daily reported. The vessels were reported to be Type-093G submarines just completed by a shipyard and ready to be delivered to the Navy of the People’s Liberation Army. Type-093G is an advanced version of Type-093, China’s second-generation nuclear-powered attack submarines. Compared to the relatively short 110-m regular variant, the Type-093G has a longer hull to make room for a vertical launch system, the report said. The launchers are designed to fire YJ-18, the vertically launched version of China’s YJ-12 supersonic anti-ship missile, according to the Navy’s website. The advanced missile can reportedly carry a 300-kilogram warhead to a range over 200 kilometers and is capable of performing maneuvers at speeds of up to Mach 3 just before hitting its target. The Type-093G submarine also has improved speed and mobility, and reduced noise compared to the regular version, the website said. PLA’s Navy is believed to have up to six Type-093 submarines currently in service in addition to three older Type-091s. A new Type-095 submarine is currently in development. China also reportedly has four Type-094 ballistic missile submarines carrying JL-1 or JL-2 nuclear missiles. 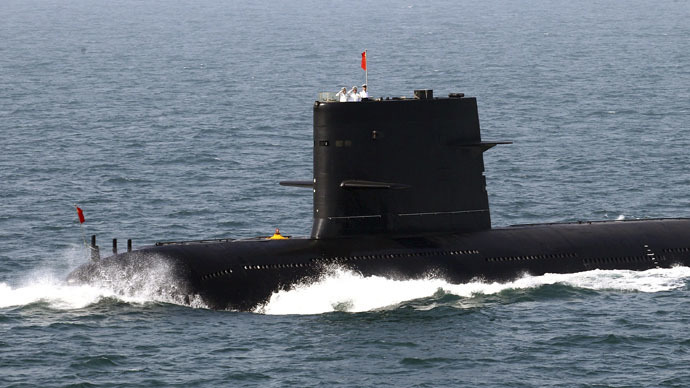 Earlier in February, US Vice Admiral Joseph Mulloy said China had surpassed the US in the total number of submarines. “They are producing some fairly amazing submarines and they are actually deploying them,” he added, explaining the Chinese vessels are being sent on longer missions to regions located further from China. The assessment sparked fears in the US that China would be able to strike American territory from its submarines deployed in the Pacific. However, the fears may be exaggerated, since JL-2, which according to some estimates has enough range to reach Alaska, Hawaii or the US military bases in Guam, is believed to have been in service since at least 2012. Chinese naval development was addressed in the US-China Economic and Security Review Commission’s annual report to Congress in December last year, Military.com reported. Among other issues the commission commented on Chinese-Russian military development cooperation and a joint deal to build new attack submarines.